A dental crown, also known as a cap, is often the best way to improve the structural strength, and cosmetic look of teeth that have been heavily filled, broken down by tooth decay, worn excessively, or chipped. If you have missing teeth, a dental bridge could be the solution. A dental bridge is a false tooth, known as a pontic, which is fused between two porcelain crowns to fill in the area left by a missing tooth. The two crowns holding it in place are bonded onto your teeth on each side of the false tooth. This is known as a fixed bridge. This procedure is used to replace one or more missing teeth. Fixed bridges cannot be taken out of your mouth as you might do with removable partial dentures. 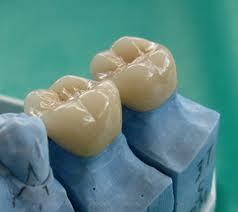 Your crown or bridge may be made from porcelain, gold or a combination of the two. We only use the best products available worldwide including Procera porcelain crowns which is milled in Sweden and express couriered to our office.